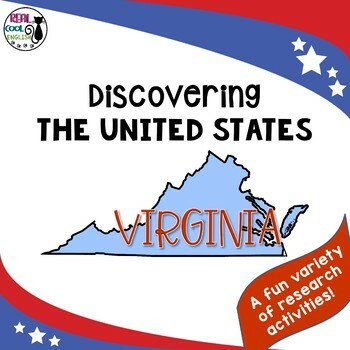 Discover Virginia with this activity packet! Students can learn more about their own state or discover another state. This is also a great way for adult ESL students to learn more about this new country they call home! I have used this activity by assigning each student a different state to research and then present to the class as a commercial for people to visit "their" state. The students loved this activity, and they learned so many interesting things about the United States. There are many other ways to use the materials, and there are a variety of activities in this collection that can be used to suit your needs. 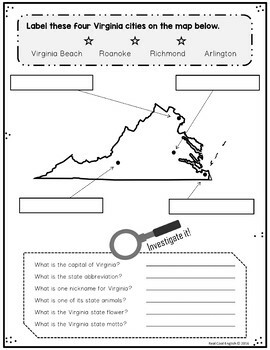 A U.S. map that highlights Virginia and shows bordering states for the students to identify and label. A short pre-research activity to have the students write what they know about the selected state and what they would like to find out. A quick reference activity to have students find and label the major cities of the state and find out a few fast facts about the state. A graphic organizer to make notes about the information they find from their research. A worksheet to identify and research an influential person from the state. A state map with major or important cities labeled and a worksheet to investigate a specific city. Assignment to create a commercial about the state and/or a tourism poster. A research credit worksheet to keep track of where the information or pictures came from as they research the state. An acrostic poem using the letters of the selected state. Graphic organizer for writing an opinion paragraph about the state. Graphic organizer for writing a compare and contrast paragraph to compare two states. A research closing activity to summarize what the students learned about the state that they researched and what they would still like to know about the state. A large blank map of the state that can be decorated with drawings or pictures of symbols related to the state. A Google Slides version is also included in case they would like to use clip art to decorate their maps. Grayscale versions of any worksheets that have color. 4/19 Update: New graphics and now includes a digital option using Google Slides. NOTE: If you need more than one state, grab the bundle for the biggest savings! If you enjoyed this product, I would be very grateful for your feedback. It's easy and fast! Plus, you will earn credits to use toward future purchases in any TpT store! If you have any questions, concerns, or suggestions, please post in the question to seller section or email me at the address listed on the downloaded product. Not sure how to leave feedback? Please go to your My Purchases page. Next to each purchase you'll see a Provide Feedback button. Simply click it and you will be taken to a page where you can give a quick rating and leave a short comment for the product. Each time you give feedback, TPT gives you feedback credits that you use to lower the cost of your future purchases. I ❤️ followers! click the FOLLOW ME link to get sale alerts, updates and news about future products.